Besides being a trail attorney, I am President of the Robeson County Humane Society. Four years ago RCHS began the annual tradition of the Puppy Love Valentine’s Dinner as a fund raiser. One of our most energetic officers stuck up an e-mail conversation with Bill Berloni, world famous animal trainer. Bill trained all the “Sandy” dogs for the movie and Broadway play, Annie. He trained the cat in Mr. Wilson’s War and Bruiser in Legally Blond. Lumberton is a small North Carolina town on Interstate 95 so we were thrilled to have someone of Bill stature. RCHS has its own no-kill shelter near our small airport, but we are concerned always about conditions at the Robeson County pound. Since Bill advised all the public pounds in the State of New York we asked him to inspect our county pound on the way from Raleigh Durham Airport. He did so. But when Bill arrived early at the dinner I overheard him tell some folks that he was saddened that he had seen a little Collie mix puppy at the pound. He said his first dog was a Collie. Little did he know that my wife Joan and I are Collie and Sheltie lovers. I could not sleep that night, imagining the pup. Next morning early I typed some signs and put them up at the pound on the way to a deposition. I encountered the pound director on the way out who told me he had orders to put down all the puppies immediately because of a distemper scare. I could not talk him into letting me have the playful Collie mix pup. So I called the County Veterinarian, Dr. Curt Locklear. I could almost see Dr. Locklear’s vexation when he heard they would not let me adopt the puppy. He said he knew I was going to get the dog isolated and vetted and that it would be alright if I took him. I had Dr. Locklear tell the pound folks what he had told me, and by mid morning RCHS volunteers had the dog safely in quarantine at Dr. Locklears animal hospital. I then called Bill Berloni in New York City to tell him that we had saved the pup that he had mentioned from his visit to the pound. I asked Bill the name of his first Collie and he told me “Rexie”. I said that with his permission and in memory of his “Rexie”, we would name this one Rexie. A year later Bill returned for the Second Annual Puppy Love. I introduced him to the audience with the story of how we got Rexie. Little did Bill know that just outside the French doors to the banquet room, Joan had Rexie on a leash. On cue Rexie walked in. Bill knelt down. I think Dogs just know. I thought Rexie would lick Bill’s face completely off, and Bill was a little too overcome for a while to start his talk. Today Rexie is our law office dog. He comes to work every day and greets all the clients. Lawyers from all over the state ask if Rexie can be present for the deposition or mediation we are doing together and of course Rexie always accommodates requests for his presence. We take turns walking him and he spreads his time equally among the legal assistants. And Rexie likes celebrities. 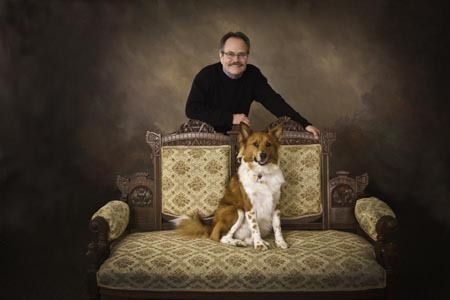 So a couple of years later Jon Provost (Little “Timmy” on Lassie) came and talked to us at Puppy Love, and Rexie and Jon stopped by my portrait studio and had their portrait made. More on that story later but the photo is at the top of this article.